Sara Ali Khan is all set to shine with two of her upcoming movies. But she has already made her first television appearance with a stunning debut on Koffee with Karan recently. We can’t get over her sassy statements beating her dad to the rapid fire round. We also saw old videos of Sara enacting certain scenes. At first, it was difficult to recognise her, she has lost a tremendous amount of weight since then. Let’s have a look at the body transformation of Sara Ali Khan, from fat to fit! She got candid at the show and spoke about having PCOD due to which she was chubby and she couldn’t seem to lose those extra pounds. Sara realised she wanted to become an actor by the second year of her college but she also knew she had to lose a lot of weight by then. 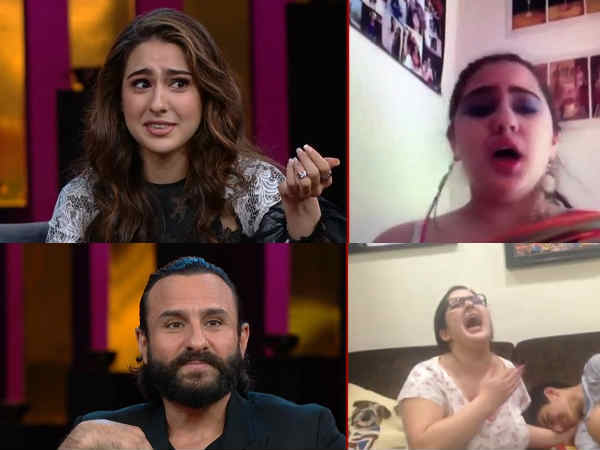 Being Saif Ali Khan and Amrita Singh’s daughter, she had a lot of pressure on her with her debut and she was determined to do it perfectly and look her absolute best! So Sara put in a lot of hard work and effort to get into such good shape, it did not just happen overnight. She started working out extensively in her senior year. She used to hit the gym every day. Running on the treadmill on Bollywood music really got her going. Now ever since stepping into Bollywood, she has made fit and inspiring workout buddies, Malaika Arora, Amrita Arora and her own stepmom Kareena Kapoor Khan. She is often seen doing Pilates with them. Pilates is actually a great form of exercise because unlike gymming that bulks or shortens muscles, it focuses on lengthening the body and overall alignment. Sara says Pilates is really fun and you never feel tired. In fact, your body feels rejuvenated after the session and there’s no better way to enjoy the workout. She also loves doing Yoga and simply dancing to Bollywood music with insane energy. Although the Industry is changing and we see women of all shapes in the movies but Sara wanted to be fit for her own sake. She shared, “Yes, in many ways we as an industry are progressing and accepting. But having said that, it is not just about being accepted, it is also a personal choice. It’s not like I aspire to have a size zero figure, it’s not going to happen and I’m okay with that. But you don’t have to be 96 kgs either. Apart from just acting, it is not a healthier way to live. I was really huge and for no reason. It messes up your hormones, your health. It is just a bad place to be mentally, physically and emotionally. Having PCOD, the first and foremost thing to do is to avoid junk food. Or for any condition for that matter, junk food is never your friend. Her typical day’s diet includes idlis for breakfast, light and healthy. And she makes sure she drinks lots of water from the beginning of the day. It is good both for having a fit body and great skin. In lunch, she has a balanced diet full of healthy vegetables, chapatti, and rice. You have to make sure you get all your nutrients. Dieting is not the answer. For snacks, she takes upma or poha. Before her workout sessions, Sara haves bowl of muesli with fruits and oats. Post her workout, she takes protein shakes, green beans, Salad, and tofu. For her dinner again she goes for rotis and vegetables. She has opted out of unhealthy food completely. Evidently, Sara has had a complete transformation and she looks absolutely gorgeous. Now she is all set to take everyone by storm with Kedarnath and Simmba!